Sportkin - Latest Buzz - - How do I add a Sporting location ? 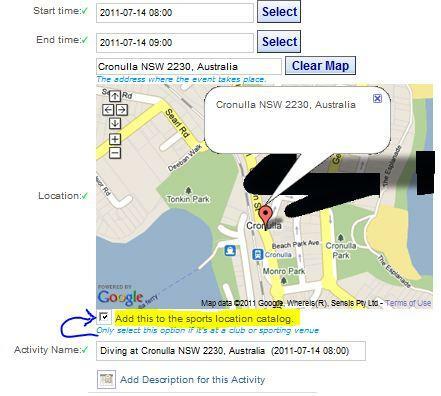 Below is the animated procedure on how to add a location using sportkin. This method is not the only way to add a sporting location, however it is the most accurate way. Begin to enter a sport and auto fill will do the rest. If you know how to code in HTML Language then you can prepare it to add it into the "More info section" so visitors get an insight to the location and see whats going on if there are any activities in the area. Members can also create activities via thier home page when logged in to Sportkin. When creating a new sports activity there there is the option to "add this to the sports location catalogue" It becomes visible once you select "view map"
Note: If your response requires information beyond this article, then you may Contact Sportkin via feedback Thank you. How much does it cost to use Sportkin?